SEE THIS EVENT LISTING ON FIGHT SPORTS INSIDER - CLICK HERE! defeated Colleen Saylor (Paso Robles, California, USA, 0-5, 126.4, 5'7", 3-26-83, Kru Albert Malatamban, (805) 534-4137) by Unanimous Decision. Judges: Kim Kongkriangkai 30-29, Marcos Guevarra 30-29, Vichai Supkitpol 29-28. THIS FIGHT DID NOT TAKE PLACE. Replacement for fighter Miguel Ayala, Keith Beard was not cleared to fight by the doctor due to high blood pressure. Dr. advised fighter to follow up immediately with his primary provider. defeated Vanessa Gonzalez-Leon (North Hills, California, USA, 3-2, 125.4, 5'4", 1-6-87, Julio Trana, (818) 282-4854) by Unanimous Decision. Judges: Kim Kongkriangkai 29-28, Marcos Guevarra 29-28, Dan Stell 30-27.
defeated Jay San Luis (Fontana, California, USA, 4-5, 127 5'7", 3-10-95, William Sriyapai, (909) 367-8956) by Unanimous Decision. Judges: Kim Kongkriangkai 30-27, Marcos Guevarra 30-27, Dan Stell 30-27.
defeated Ariana Gomez (Sun Valley, California, USA, 6-3/1, 111.8, 5'2", 8-10-90, Troy Fisher, (818) 272-5653) by Split Decision. This bout was scheduled as a 4 round title bout by the promoter. Due to a majority draw at the end of the fourth round, the promoter requested an additional round to determine a winner. defeated Obi Ukoha (Corona, California, USA, 3-2-2/2(C), 159.2, 5'11", 4-21-93, William Sriyapai, (909) 367-8956) by Unanimous Decision. Judges: Kim Kongkriangkai 40-36, Marcos Guevarra 40-36, Vichai Supkitpol 40-36. Spencer Mix received foot x-ray and was cleared by Dr. Larry Vigilia. defeated ***Jenna Kazmierczak (Vista, California, USA, 3-1, 126.2, 5'6", 9-13-91, Bryon Schnell, (949) 735-8414) by Unanimous Decision. defeated Brandon Lane (Los Angeles, California, USA, 4-2, S: 1-1, PANK: 3-1, AB: 0-2, 163, 6', 4-30-88, James Poidog Parher, (626) 354-5023) by KO at 1:00 minute into the 5th round. Brandon Lane has been issued a 45 day No Training & 60 Day No Competition Medical suspension by Dr. Larry Vigilia due to K.O. and possible concusion until February 4th, 2015 and cleared by provider. defeated ***Manuel Carlos (Fontana, California, USA, 4-3, 142.8, 5'6", 6-24-77, William Sriyapai, (909) 367-8956) by KO at 1:17 into the first round. Manuel Carlos has been issued a 30 day No Training & 45 Day No Competition Medical suspension by Dr. Larry Vigilia due to K.O until JANUARY 20th, 2015.
defeated ***Barry Hawkins (North Hollywood, California, USA, 3-3, 161, 1-23-82, Jermaine Soto, Requested Unlisted) by TKO. Barry Hawkins has been issued a 30 day No Training & 45 Day No Competition Medical suspension by Dr. Larry Vigilia due to TKO until JANUARY 20th, 2015. Lyle Joe Davis received hand x-ray and was cleared by Dr. Larry Vigilia. defeated Ardavan Moeini (Irvine, California, USA, 4-1/2, 148, 6'1", 4-30-91, Colin Oyama, (714) 803-4977) by TKO. Ardavan Moeini has been issued a 30 day No Training & 45 Day No Competition Medical suspension by Dr. Larry Vigilia due to T.K.O until JANUARY 20th, 2015.
defeated Ritchie Sandoval (Garden Grove, California, USA, 6-5-2, 140.8, 5'5", 3-7-90, Randy Louie, (714) 606-2523) by Unanimous Decision. Ritchie Sandoval's cut over his eye was cleared by Dr. Larry Vigilia. 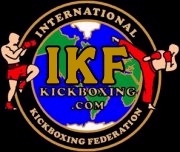 PAST IKF CALIFORNIA EVENTS - CLICK HERE!